If you had a really, really, really good telescope and took a peep at the International Space Station (which would be quite a feat for as quickly as it moves across the sky), you might notice what looks like a make-up kit or a watercolor palette dangling from the side of the station. While some astronauts have taken their makeup into space, and some have found time to create art in orbit, they don’t tend to leave their supplies attached to the outside of the ISS. Ruling those out, instead what you’d probably be looking at is a Materials International Space Station Experiment (MISSE). 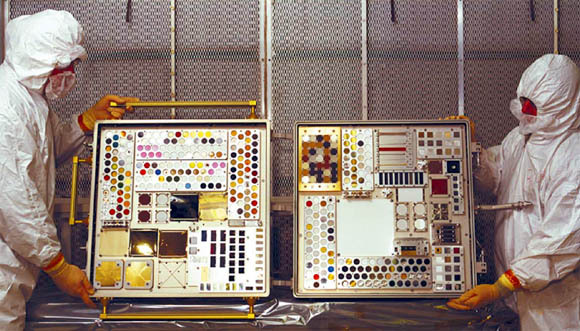 MISSE projects serve as a laboratory to test and study various material samples as they’re exposed to a space environment. Attached on the outside of the ISS, the specimens are simultaneously exposed to a variety of conditions that would be very difficult, if even possible, to mimic on Earth, including exposure to: atomic oxygen, various levels of radiation, vacuum, extreme temperatures, and zero gravity. While MISSE wasn’t the first project of this type–similar experiments had been carried out on Skylab, Mir, and NASA’s Long Duration Exposure Facility (LDEF)–it was the most formal and programmatic. The first two MISSE projects were deployed in 2001, carried to the ISS via the Discovery crew of STS-105. They were originally planned to only be deployed for one year, but as a result of the grounding of the Shuttle program following the STS-107 Columbia disaster, they ended up staying in orbit for 3 years. There were a total of 8 MISSE experiments conducted by NASA, sometimes deployed in multiples and sometimes singly. The samples are loaded into trays and installed inside suitcase-like Passive Experiment Containers (PECs). 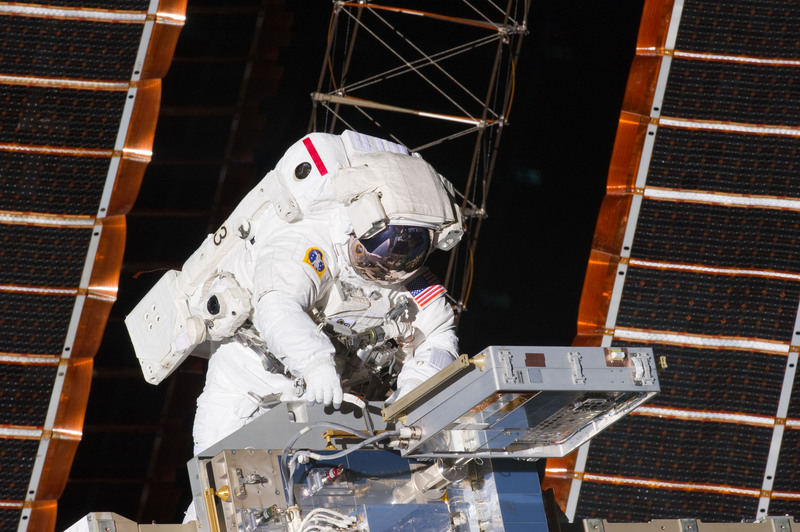 When ready to be deployed, the PECs are carried outside the station during an EVA (extra vehicular activity), and fastened to the station’s exterior. The mounting location has changed throughout the program’s history. Samples from MISSE 3 and 4 carried 8 million basil seeds that were then provided “to children for science experiments to stimulate interest in space science”. Other samples included paints, lubricants, fabrics, and solar cell technologies. In total, more than 4,000 samples have been tested through MISSE. MISSE is now a privatized, commercial facility owned and operated by Alpha Space with a permanent placement on the ISS. The facility and its first set of experiments have been manifested to fly to the International Space Station in September of 2017 on the SpaceX Dragon resupply vehicle’s flight SpaceX-13. 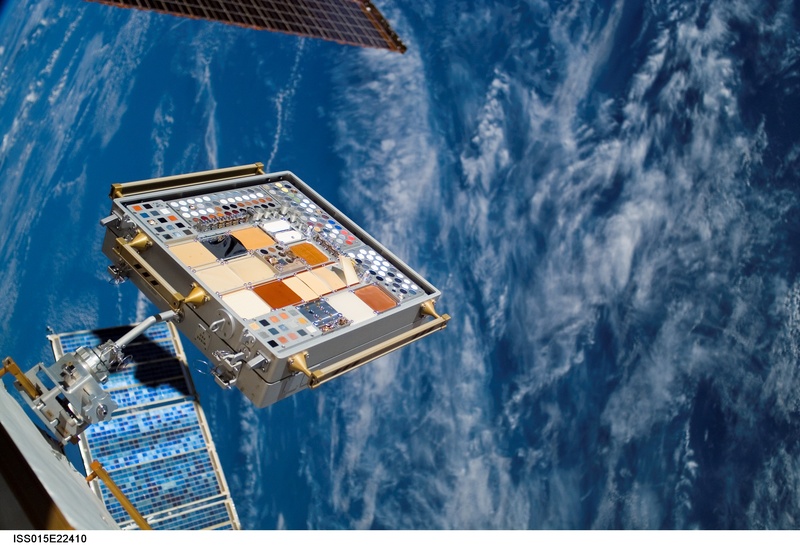 Now dubbed MISSE-FF (Material International Space Station Experiment Flight Facility), Alpha Space’s contract is good through at least June 30, 2024 (currently the authorized remaining lifetime of the station). Alpha Space’s plans call for a permanently-mounted tower that will hold multiple PECs at once. If the customers are there (some have already signed contracts), Alpha Space is ready to provide routine testing in the unparalleled environment of space. They expect to begin operations this year (2017).